When word gets around in the recording industry that so-and-so is a hot session player, the demand for his talent grows considerably. 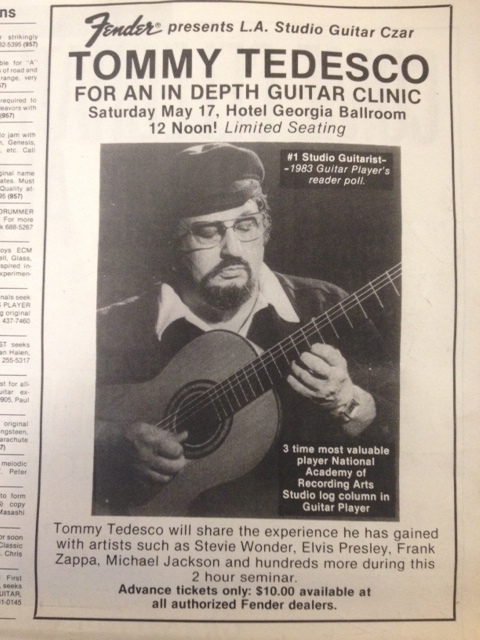 For Tommy Tedesco, who hosts a guitar clinic at the Hotel Georgia May 17, it’s been growing for 30 years. Today he’s the most wanted studio guitarist in Los Angeles. 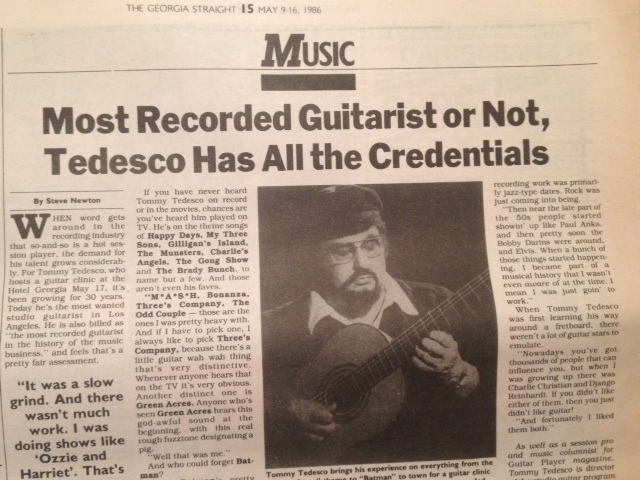 He is also billed as “the most recorded guitarist in the history of the music business,” and feels that’s a pretty fair assessment. “Well, let me put it this way,” says the burly 55-year-old, “it’s as accurate as possible. We always kid about it, you know, and if there’s somebody that decides that I’m only number two, that’s okay. During his studio career, Tommy Tedesco has played on thousands of records. When the ’60s recording boom was on, he played on all the early sessions by the Beach Boys, Jan & Dean, the Mamas & the Papas, and Phil Spector. As well as records for everyone from Doris Day to Frank Zappa, Tedesco has recorded innumerable movie soundtracks. He did Airport. He did Zoot Suit. Remember those poignant Godfather licks? He was even playing cool on Mary Poppins. And he has his own favourites. If you have never heard Tommy Tedesco on record or in the movies, chances are you’ve heard him played on TV. He’s on the theme songs of Happy Days, My Three Sons, Gilligan’s Island, The Munsters, Charlie’s Angels, The Gong Show and The Brady Bunch, to name but a few. And those aren’t even his faves. “M*A*S*H, Bonanza, Three’s Company, The Odd Couple–those are the ones I was pretty heavy with. And if I have to pick one, I always like to pick Three’s Company, because there’s a little guitar wah wah thing that’s very distinctive. Whenever anyone hears that on the TV it’s very obvious. Another distinct one is Green Acres. Anyone who’s seen Green Acres hears this god-awful sound at the beginning, with this real rough fuzztone designating a pig. And who could forget Batman? More recently, Tedesco has done the Cocoon soundtrack, worked with Henry Mancini on the upcoming Disney movie The Mouse That Roared, and played on the TV shows Dynasty and Hotel. He also did the recent Grammy Awards show. Live. With no second takes. Mind you he got paid very well for it–as he usually does. When he started doing sessions back in 1953, things weren’t quite as lucrative as they are today. “It was a slow grind,” admits Tommy. “And there wasn’t much work. I was doing shows like Ozzie and Harriet. That’s when Ricky [Nelson] was just a little boy of nine or ten. There was just a few of those shows, and the recording work was primarily jazz-type dates. Rock was just coming into being. 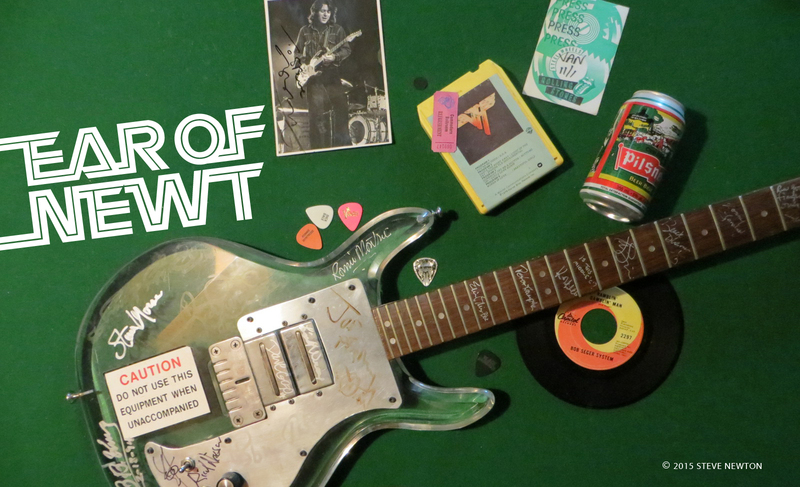 When Tommy Tedesco was first learning his way around a fretboard, there weren’t a lot of guitar stars to emulate. “Nowadays you’ve got thousands of people that can influence you, but when I was growing up there was Charlie Christian and Django Reinhardt. If you didn’t like either of them, then you just didn’t like guitar! As well as a session pro and music columnist for Guitar Player magazine, Tommy Tedesco is director of the studio guitar program at Hollywood’s Guitar Institute of Technology. His two-hour seminar takes place May 17, 12 noon, at the Hotel Georgia ballroom. Advance tickets are ten dollars at authorized Fender dealers. There is limited seating, so get them while you can.